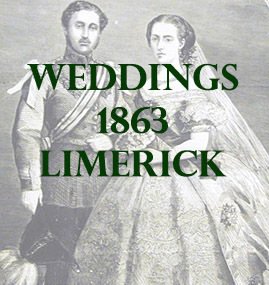 The following list contains marriages from 1863 that mention places in county Limerick, the year before the full civil marriage registrar comes into Ireland. Whether it was the marriage location, the ancestral home of the bride or the home of the groom. At Adare Church, by the Rev. James Walsh, on Wednesday last , Henry Norman, Esq., Rathkeale, to Hannah, eldest daughter of John Smith, Esq., Adare. The happy pair proceeded same day to Dublin. Sept 28th at St Michael’s Church in this city (Limerick), by the Rev Mr Bailey, Mr John Darragh, the Strand, late of Belfast, to Eliza Barber, Patrick Street, relict of Mr Robert Barber of Liverpool. On the 13th inst., at the Lower Shandon, Cork, by the Rev. G.B.Grant, Thomas Prosser of Brooklands Esq., county Limerick, to Eunise Teresa, eldest daughter of the late George Hopkins Esq., M.D. of the H.E.I. co.
On the 24th inst., at the Roman Catholic Church, Newcastle West, by the Rev. T. Corkerry, CC., James J Long Esq., to Ellen third daughter of Parick Hickie, Esq., Newcastle West. At St. Michael’s (Limerick) by the Rev Henry Peacocke, Harrison Lee jun., Esq., North Strand to Kate, daughter of Zachary Myles Esq., Nelson Street. At Kilteely Chapel, on the 3rd inst., James Hartigan, Esq., Crean Lodge, county Limerick, to Maria Wilhelmina, eldest daughter of the late Timothy Ryan, Esq., Coole House, in same county.